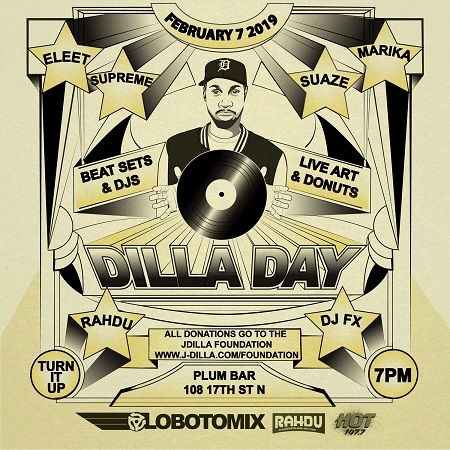 Dilla Day 2019. Presented by DJ Rahdu and LBMX. Celebrating the life and music of @J Dilla. Presented by DJ Rahdu and LOBOTOMIX. This event, on the 44th anniversary of his birth (and 12th anniversary of his untimely death), is a celebration of the life work of J Dilla and a fundraiser for the J Dilla Foundation – a non-profit organization that serves to help fund inner-city music programs, and provide scholarships to students attending schools that have progressive music curricula. Anyone who knows Hip Hop knows the legacy of Jay Dee on the music and the scene. Come celebrate his life and work with us. Five Birmingham DJs and producers will build sets around the music and influence of Jay Dee, incorporating original work and work from Jay Dee’s extensive catalogue. “Detroit musician James Yancey — also known as J Dilla and Jay Dee — was one of the music industry’s most influential hip-hop artists…” – NPR.